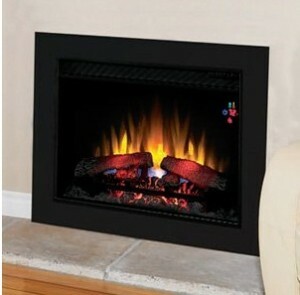 Ambience is the operative word when describing the ClassicFlame 26 inch SpectraFire™ Fireplace Insert. This modern and attractive electrical fireplace makes it so easy for you to enjoy flickering flames and supplemental warmth, and it can be installed anywhere. The optional flush mount conversion kit makes this flexibility possible. You can install it right into a finished wall or a cabinet if you wish. The kit ensures the proper air flow and provides professionally finished trim. 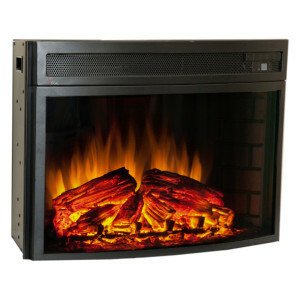 The firebox is feature rich with high tech details that are sure to appeal to anyone. The multi-function remote control will allow you to change settings without even walking over to the fireplace itself. The on-screen digital temperature reading makes it easy for you to set the heat to personalized levels. The SpectraFlame™ technology even gives you control over the flame intensity and brightness so that you can create the perfect ambience for your home. This electric fireplace insert offers up to 400 square feet of supplemental heat and it provides a focal point that will add drama and romance to any room. Customers love that it is extremely easy to set up and the conversion kit makes it simple to install in any space.